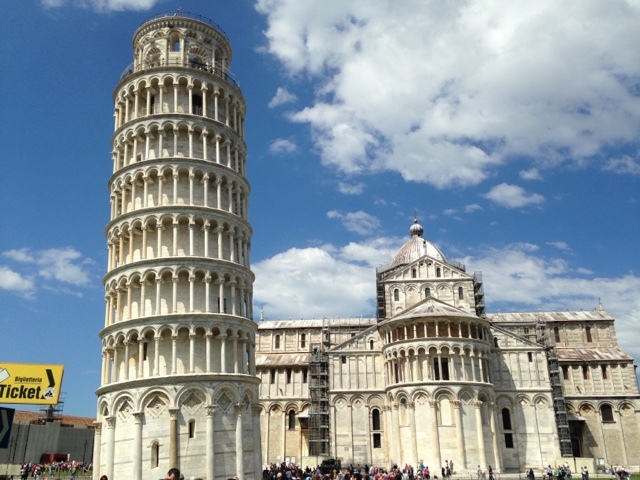 We headed down to Pisa in the morning after breakfast. Those of you who know me well will not find it surprising that we hit Mercatopoli, a thrift store at which I felt right at home, and picked up a couple of interesting items to bring home. 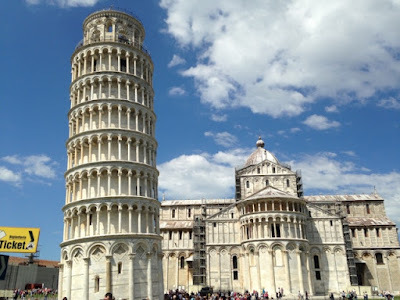 Onwards to the city of Pisa, and purchase tickets to climb the tower. Joe and Mindy waited down below, and held our bags, since security was tight and no purses, backpacks or guns were allowed on the stairway. The security police were highly visible, and serious about things, but still willing to have children photographed in front of the military vehicles parked in the shado of the tower. Full auto weapons at the ready. The view from the top was marvelous, and a cool breeze was blowing. A very pleasant experience. This was definitely the most touristy place we've been so far. It should be good prep for Rome. Leaving the scrum, we headed north once more to a small winery recommended by our friend Michael, Enza di Carmigniana, in the hills on the road called the Strada di Vino, near Montecarlo. 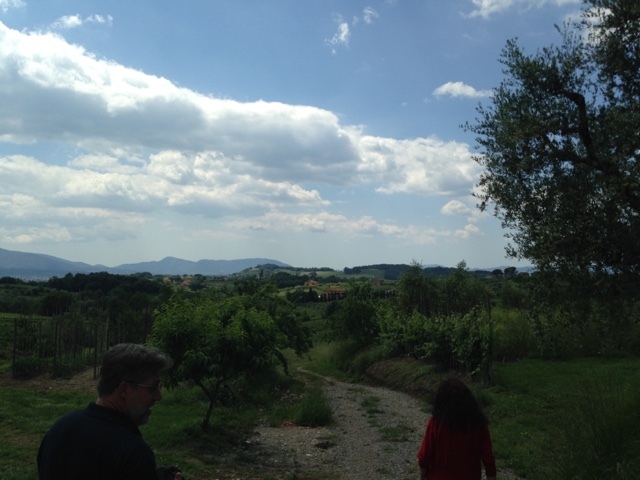 The owner of the winery, Elena, gave us a short tour of the facilities, and history of her family, who have been making wine in the same location since 1386 - Elena is the first female to run the winery, her only brother did not want anything to do with the family business. We then enjoyed an intimate private tasting of three whites, a rose, two reds and two special "dolce" wines, each paired with the food which complements it well, from fresh tomatos out of the garden to the sausage made from white pigs at a nearby farm, to aged pecorino cheese with honey. Absolutely incredible, and every one of them delicious. We purchased quite a bit, and Elena gifted us with a bottle of red blend on our way out, as well. She also called the nearby visitors bureau and made arrangements for us to meet a young lady there for a private tour of the old theatre in town, so we drove up to the castle in Montecarlo and met Mariella, a charming girl who let us in to the building and gave us the history of its use, disuse, restoration and all the rest. 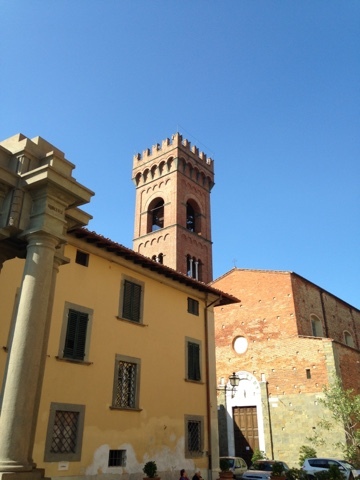 We wandered about the town for a bit, chatting with the nonas, enjoying a cone of gelato, and enoying the spectacular view of the Tuscan countryside. Back to the hotel for a while, enjoyed a bottle of wine by the pool in the sunshine, then drove down to Lucca where we once again enjoyed the company and cuisine of our friends Michael and Anita. Anita prepared a variation on traditional Polish pirogi for us (she comes from Poland), and chatted with us about the history of her mother's recipe, which she has altered to take advantage of the finer ingredients available in modern Italy. A short stroll in Lucca town, then back to our rooms to slumber peacefully.